I know it's been a long time since I haven't published a post but I have way too much studying so I can't dedicate that much time to my blog #feelingsad. However,few days ago I managed to find some time to take these photos and show you some things that I'm currently wearing very often and find really nice. All of the photos are taken in Banja Luka and probably in the future you'll be able to see more photos from here than from my hometown,Derventa. But let me get to the topic of my today's post : DRESSLILY and SHEIN. 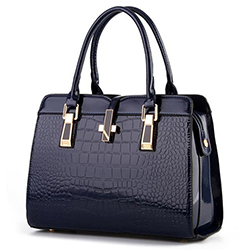 "DressLily is a leading international online fashion clothing and accessory store. Focusing on the very latest in affordable fashion styles, both attire and stunning accessories, we feature thousands of the newest product lines, providing maximum choice and convenience to our discerning clientele. 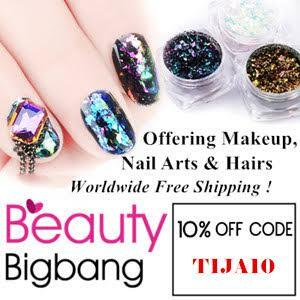 We also aim to provide an extensive range of high quality, trendy fashion clothing together with a professional dedicated service to our valued customers from all over the world." It is my first time to collaborate with DRESSLILY so I wasn't actually sure what to expect.When the things arrived from the wishlist I did (here) I was amazed. I was little bit surprised as well because I thought I ordered "No pants are the best pants" sweatshirt but I guess I clicked something wrong and got this one "I'd rather be sleeping".The material is super soft and everything about this sweatshirt is amazing. 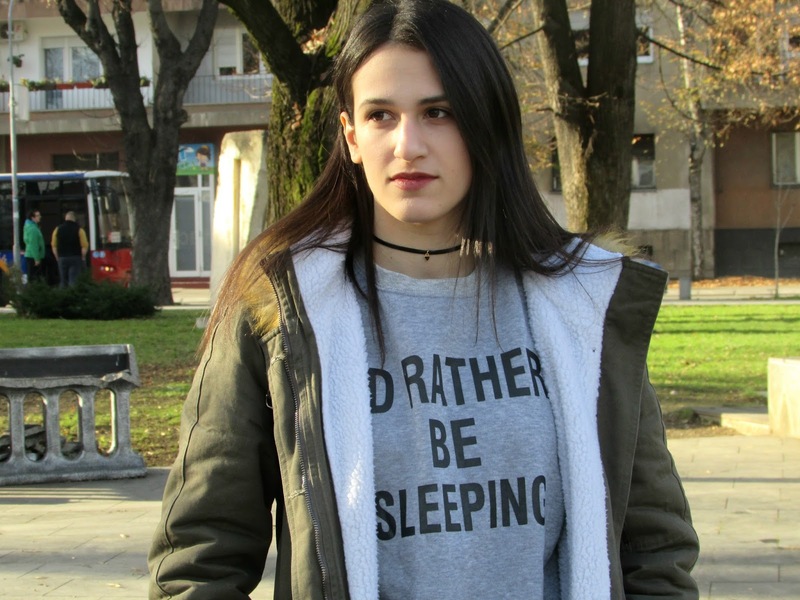 This kind of outfit that I'm showing you in today's post is something I wear to the university every day.The sign "I'd rather be sleeping" describes me very well each morning since somehow I'm always in lack of sleep. Another thing I ordered is the backpack.It is my life saviour each time I need to travel from Banja Luka to my hometown and it's such a piece.I wear it each day and the quality of the backpack is super amazing.If it ever falls apart I'll surely order another one since for this price I don't think you can make a wrong decision. Also another thing I got is this triangle choker.I'm not a person who wears chokers that much but this one is nice and easily combined so I say yes to this one. SheIn has been around since 2008, and has now become one of the most acclaimed online stores for women’s fashion. 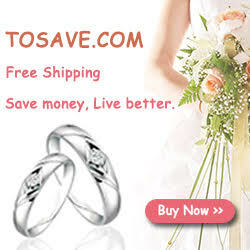 We are dedicated to providing the most cutting-edge fashion with some of the lowest prices in the entire industry. Products on shein.com are being updated faster than most of its competitors, catering to the tastes of different customers. SheIn’s team draws on rich experience and great passion on providing fashionable clothing for women from the ages of 16-35. SheIn is committed to the satisfaction of every customer. Our employees enjoy the excitement of developing new products and providing quality service. We guarantee efficient and quality service for our customers. SHEIN is a store from who I ordered many times and never got disappointed.I have so many pieces in my closet from their store that I can't even count them but I realised that I never have presented something from them to you and never have spoken about a store this important to me. I discovered this store a long time ago and ever since I've been ordering from them I have always been returning to order again. 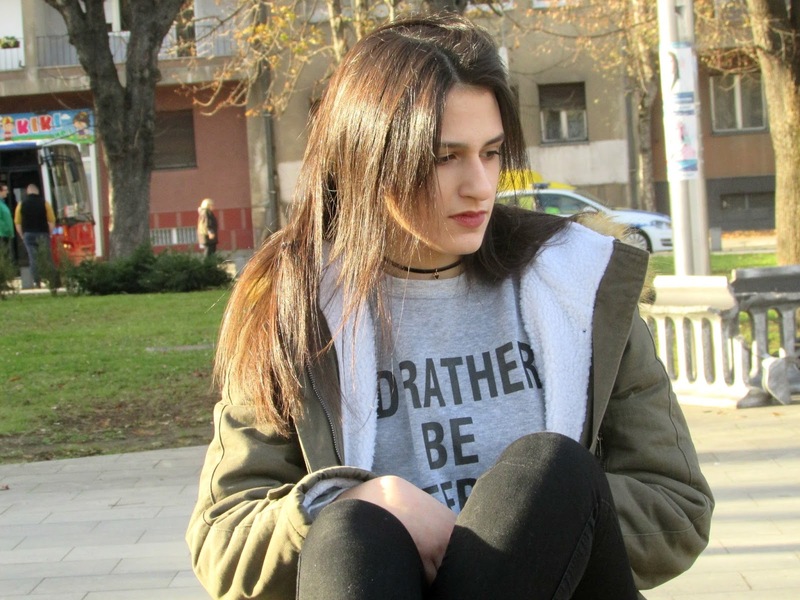 In this outfit post I decided to show you 2 things that I got from their store which I'm wearing on daily basis. 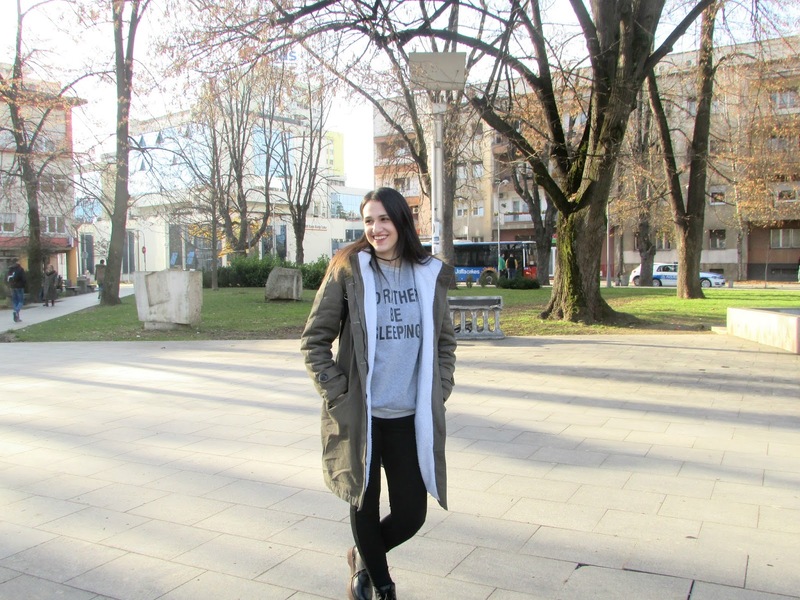 I got the army green hooded long sleeve coat few months ago and I'm super happy with it.It is really warm,long and perfect for winter days.I got it for only 25$ because it was on discount but now unfortunately it is sold out. 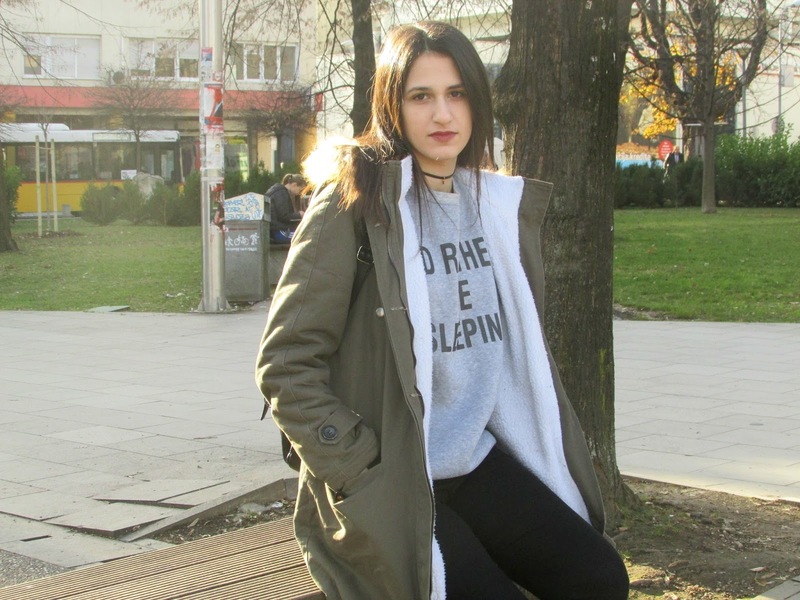 When I first got the coat(it looks more like a jacket to me) I thought it was way too big on me but later I realised it is perfect for me and ever since then,it became my daily jacket in which I go everywhere. Another thing I ordered from SHEIN store and got super amazed are these black lace up platform boots which remind me so much of Dr.Martens boots. They haven't been that much comfortable in the beginning but now they are and I love wearing them.I have a feeling that they are such an edgy piece and because of that I love wearing them. Hope you like the photos and make sure to check out both stores : DRESSLILY and SHEIN. Outfit je predivan, ti si preslatka. ♥ jakna je topp! wow. you look amaizing ;) great outfit! WOOOOW !! Odlican outfit. Jaknica je vrh !!! Predivan post, jako dobro ti stoji autfit. Backpack looks lovely for me! Hello dear, you look fantastic !! I love your style. Great jacket and backpack. Shirts so accurate and beautiful outfit! You look great! Shein really is a nice website. Super cute top, love it ! Linda! Adorei o look *. * Apaixonada pela mochila!